Pure excitement, eight seconds at a time! Time flies when you’re having fun. 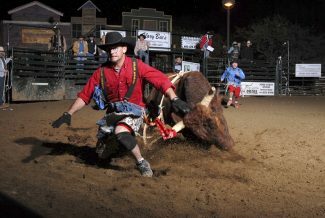 And for folks who enjoy watching world class bull riding as well as great food, drinks and atmosphere, there’s nothing like the Dirt Tour bull riding events held at the Buffalo Chip Steakhouse and Saloon in Cave Creek, Arizona. The excitement of PRCA (Professional Rodeo Cowboys Association) and PBR (Professional Bull Riders) bull riding makes time at the Buffalo Chip just fly by, leaving you anxious and ready for the next event a few days later. But for the cowboys straddling a couple thousand pounds of dynamite wrapped up in a dusty bull hide, eight seconds can seem like an eternity. This combination of mixed perceptions of time takes place Wednesday and Friday evenings in one of the most unique settings for an event of this type to be found anywhere. 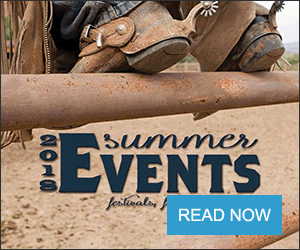 Owners of the Dirt Tour, Dave and Cindi Smith, operate their events in a way that makes for a great experience for both bull riders and spectators. This is a top notch set up, originally conceived by their son, Thor, as a way to practice his bull riding while creating a place for other professional bull riders to meet, practice and also compete on a regular basis. When Dave and Cindi were approached by Buffalo Chip owner Larry Wendt about holding their events at his place, a unique combination of complimentary factors came together, and a fascinating series of events began to take form. With the Buffalo Chip’s multiple grills, wet bars, dance floor, live bands and big screen TV showing the bull riding “live” as it happens in the on-site arena, fans were presented with the incredible opportunity of enjoying a night out with all of their favorite things wrapped up in one package without ever having to leave the premises. With a top notch staff of professionals behind the scenes running the events, the Dirt Tour has become a highly respected entity in the sport of bull riding, as witnessed by the fact that professional bull riders gravitate to the Buffalo Chip from across the country to practice their sport in the Dirt Tour. Folks like arena boss Tom Felton, production assistant Lisa Paiva, judges Jake Sporbert, Zack Holwerda, Randy Turnin and John Law make up the staff of the Dirt Tour. Jeff Riggs keeps the bulls coming from the back pens to the chutes where Cindi takes over as chute boss. Cindi’s husband Dave keeps the crowd and the riders informed from the announcer’s booth, and professional photographer Ralph Prideaux is always right in the middle of the action capturing the breath-taking excitement on film. Last but certainly not least, the Dirt Tour employs some of the best “bull fighters” in the business, like Jon Martin and Casey Wells. These guys, commonly called “clowns” by the public, are so much more than just athletic fellows in funny costumes entertaining the crowds with their antics at rodeos. These fellows are the cream of the crop when it comes to out-maneuvering a bull and getting between a cowboy and certain injury when the eight second timer goes off. Just because the ride is over doesn’t mean the cowboy is in the clear yet. Cowboys and knowledgeable fans know that the bull fighters are the ones who repeatedly place themselves in harm’s way each night to give the cowboy his route of escape after a ride. The skill of the bull fighters at doing this time and again without injury to themselves is amazing, although many have paid their dues in the emergency room. Wednesday nights at the Buffalo Chip, the Dirt Tour hosts the “challenger Series” bull riding event which is a practice night for bull riders, but with an interesting twist. Each bull is assigned a point value based on its difficulty level, and each time a cowboy makes a qualified ride on a bull he is awarded that number of points. At the end of six weeks the cowboy with the most accumulated points is crowned “Challenger Series” Champion and receives a trophy buckle from Champions Choice Trophy Buckles. Something of interest to those of you who might be interested in improving your bull riding is the two and a half day bull riding school offered by the Dirt Tour. You’ll live on-site and get on as many bulls as possible during your two and a half days of instruction. You may even want to book some one-on-one time with an instructor to get the most from the experience. 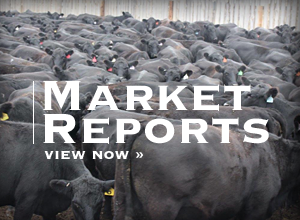 The most popular item, however, is the “Fantasy Bull Rider” package for those folks who have always dreamed of the thrill and excitement of riding one of these amazing bulls, but who are not necessarily interested in pursuing it as a career. The utmost attention is paid to safety in this package, yet the thrill is beyond description! With such a unique combination of factors coming together in one place, the Dirt Tour bull riding events at the Buffalo Chip Steakhouse and Saloon in Cave Creek, Arizona are a “must see” for anyone interested in the excitement of premiere professional bull riding in an authentic western atmosphere. Come by and check it out or call Cindi or Dave Smith at (602) 309-5754 or (602) 316-8875 for more information. They offer thrills, eight seconds at a time or by the hour, as you take in the exciting world of professional bull riding. John Moore is a professional horse trainer and clinician as well as a professional musician who resides outside of Dove Creek, Colorado. Visit his website at http://www.JohnMoore4Horses.com.